A light-hearted comment from a reader regarding my use of the term “affordable” in the last post about our Land Cruiser Troopy led me to preface this one with a bit of background. A decade ago Roseann and I had the idea to take the money we would have spent on, say, a new 4Runner, and instead refurbish a classic expedition vehicle—in that case a 1984 FJ60 Land Cruiser—with a modern turbodiesel engine and five-speed transmission, Old Man Emu suspension, and ARB diff locks. The result, after we re-engineered some egregious flaws in the original engine/transmission swap hack job done by a prestigious California company, was remarkable: a comfortable, capable FJ60 that had 40 percent more power than stock yet exceeded 25mpg on the highway. And since we had started with a straight and rust-free but tired FJ60 puchased for just $5,000, the total cost actually came in well under the sticker of a new 4Runner. And as you can imagine got a lot more attention. There are some obvious downsides to this concept. First, no matter how much refurbishing you do (short of a mega-dollar frame-off restoration), you’re still dealing with an old vehicle capable of concealing potential problem areas despite a thorough pre-purchase inspection—and you won’t have a 50,000-mile bumper-to-bumper warranty to fall back on. (On the other hand you’ll be dealing with a simpler vehicle with fewer advanced systems to fail . . .) Second, no bank is going to loan you funds sufficient to purchase a new 4Runner once you admit you’re actually planning to spend it on a 25-year-old Land Cruiser. You’ll have to have the money in hand, or figure out alternative financing (or plan on a gradual refurbishment process). Finally, securing full-coverage insurance for a vehicle you insist is worth five times its Blue Book value will be challenging. You’ll need to investigate classic-vehicle specialists. Nevertheless, we were delighted with the turbodiesel FJ60, and eager to try the same approach again. This time around our goal was more ambitious. We wanted to start with the vehicle we both feel is, all things considered, the best expedition machine on the planet, the Toyota Land Cruiser 70-Series Troop Carrier, or Troopy, powered by the company’s durable and efficient 1HZ overhead-cam diesel engine. With an excellent example secured for about $16,800 U.S. (see here), we were on our way. Next, we wanted to convert it to an efficient, self-contained camper which we could live out of comfortably for weeks or months on end if desired. This could easily have been accomplished by grafting on an oversized shell over the rear chassis, but neither of us wanted to do more than fractionally alter original lines of the vehicle, or risk the potential structural, handling, and GVWR issues of inflated non-stock bodywork—and doing so would have quickly blown through the target budget. So we limited surgical modifications to the excellent Mulgo pop-top roof conversion from the Expedition Centre in Sydney, which with a barely noticeable raising of the roofline gave us both full standing headroom and a full-size drop-down bed. Further initial modifications addressed fluid storage and outdoor shade (read here). Next, Roseann sketched plans on her iPad Pro for interior cabinetry, using the experience gained with ownership of two Four Wheel Campers and several iterations of more basic camp setups. This was the most critical part of our modifications: Roseann likes to cook no matter where she is on the planet, so a well-stocked galley was mandatory. And we like to have as much luggage and equipment as possible stored in closed lockers rather than simply strapped down and visible to passers by. With some guidelines from Daniel at the Expedition Centre, who has overseen many such conversions, the layout included a bench on the passenger (left) side of the vehicle, to maintain rear-quarter visibility from the driver’s seat, and a galley and cabinet/drawer stack on the driver’s side, which, uniquely, included provisions for our Kanz Kitchen chuck box/stove so that it could be used in situ, or removed and set up on its legs outside, comprising along with the drop-down Front Runner tailgate table and Eezi-Awn Bat 270 awning an outdoor kitchen for fair-weather cooking. Also specifed by Roseann were two flat roller drawers, each securing a Wolf Pack cargo box containing kitchen supplies and basic foodstuffs. With the Wolf Packs pulled out and stacked near the Kanz she would have a complete kitchen with an unobstructed view (one of her—very few—complaints about our Four Wheel Camper is that its fixed galley necessitates cooking inside even in nice weather). The only fixed interior kitchen item would be the sink, fed with a pressure pump from the chassis-mounted 90-liter water tank. When cooking outdoors, water is available via the ingenious Nemo Helio, an air-pressurized water delivery system for shower or galley, with a 2.9-gallon capacity. The National Luna Weekender fridge-freezer, locked down crosswise just inside the rear doors, would be accessible from either inside or outside with its hinges configured longitudinally. Next, Daniel sent CAD images of the plans, done to exact dimensions, and with the details sorted, we sent the okay to start construction. Critical last-minute tests of cabinet fit. All this planning was done with measurements, drawings, and instinct, and organized from 6,000 miles away, so we had some apprehension until we saw the finished product installed. And one night’s use was enough to lay all doubts to rest. Cozy? Yes—but both of us could sit inside while one cooked if it was frightful outside and we wanted to be buttoned up. Storage space was simply massive—we were stunned at how much of our gear disappeared inside the side and front bench and cabinets. Total time to pitch camp, including raising the roof, deploying and staking down the awning, setting out the folding table that stores cunningly in a slot in the bench, and setting out our Kermit chairs, was under 10 minutes. Is it without compromise? No. It’s still the back of a stock-bodied Land Cruiser Troopy, not the interior of a 25-foot Airstream. The comfortable dinette of our FWC is missing: Although two can eat inside sitting on the benches and sharing the slide-out table, there are no backrests, and the neck-height ledge running down both sides of the back above the windows—the support for the bed when it’s dropped—precludes leaning back very far anyway. With the bed deployed there is only a two-foot-wide standing/climbing-up space between the back of it and the back of the vehicle, just enough room for one person to dress or undress. But these are mere quibbles when you consider we’ve constructed a home away from home completely contained inside an expedition vehicle of towering strength, reliability, and capability. This photo shows the wood front of the Kanz closed; it is dropped for cooking. In terms of workmanship, the plywood cabinetry is of very good, void-free quality, but standard five-ply construction. Screw holes are filled, corners rounded, and shut lines uniform. In a perfect (and much more expensive) world I’d have had them made from multi-ply Baltic birch and had the drawers finger-jointed or dovetailed; however they look handsome as is and should be perfectly durable. The Kanz on its legs plus Wolf Packs comprise a complete outdoor kitchen. Roseann is recognizable by the spotted headscarf and numerous bits of weaponry on her belt. Systems management is dealt with in two locations. In the face of the cabinet under the sink are a level gauge for the water tank and a power meter for the batteries (as well as the rocker switch for the faucet, which is on-or-off and could be improved with a variable-pressure control). And behind the driver’s seat is a recessed compartment containing the charge controller for the solar panel, a fuse panel, the easily replaceable water pump, and the hard-mounted ARB Twin compressor. There is room left over for the air hose and chuck for the compressor, and a tire repair kit. Our best gauge for the success of a camp setup is that after several days out, when we take a break at a nice hotel to see a town and do laundry and shopping, we find ourselves missing the camp. That has definitely been the case with the Troopy after a tour of southern Australia and a loop through Tasmania. What’s next? We’ll be leaving the vehicle with Daniel again for some odds and ends: security bars for the windows, a center console yet to be designed, storage and ready access for our binoculars. On a more major scale, the aftermarket rear springs, which were on the vehicle when we bought it, are not quite managing to hold up to the additional weight of our modifications. There’s a barely noticeable sag when fully laden with fuel and water, and neither of us can tolerate any sag. So we’ll be investigating options. I’d also like to have an ARB locker in the rear axle, since factory lockers were sadly not fitted to this particular Troopy. The brakes, despite being discs on all four corners, could use improvement. Other than that, there is very little we feel would actually enhance the vehicle. When your overlanding vehicle has a cargo area large enough to return echoes, you have a lot of options for configuring it. The basic, perfectly functional route would be to install about 40 tie-down loops in the floor, strap in a ground tent, cots, sleeping bags, a few jerry cans of water, a fridge (or three), and a chuck box, and go camping. We sort of went the other direction. Last year we drove our 1993 Land Cruiser HZJ75 Troopy (in the company of friends Graham Jackson and Connie Rodman in their own Troopy) from Sydney to Alice Springs and subsequently across the Simpson Desert via the Madigan Line (see here and here). Before the trip, Daniel Fluckiger at the Expedition Centre in Sydney neatly sliced off the roof of our perfectly sound vehicle and installed his signature clamshell pop top incorporating a full-sized drop-down bed and mattress. Although that was the extent of the modifications for that journey, the implications of having full standing headroom in the back of a Land Cruiser were clear, and we left the vehicle with Daniel to complete its transformation into a fully equipped camper that would retain the trim (?) original contours of the 78 body. The first task was to eliminate the bank of internally-secured jerry cans we’d needed to ensure an adequate supply of water on the 600-mile no-resupply route across the Simpson. Daniel had the solution in the form of an exquisitely constructed 90-liter (23 gallon) stainless-steel tank mounted solidly under the floor between the chassis rails, in the perfect position to preserve—in fact microscopically enhance—the center of gravity. The tank’s multilevel construction ensures clearance for the driveshaft and axle at full rebound. A pump will deliver contents to a sink inside, and a gauge monitors the level. Despite the snug fit and complex construction, the tank can be removed if needed by simply disconnecting the driveshaft. With dual (stock Toyota) fuel tanks totalling 48 gallons (and an efficient diesel engine), and 23 gallons of water, it’s unlikely we’d need extra capacity; however, it’s smart to have backup, and also a way to manually refill both fuel and water. So Daniel installed a Kaymar rear bumper with dual swing-out posts. Daniel and Roseann inspect the jerry can/gas bottle holder for the Kaymar. One will carry the spare tire (and our nifty outback braai); the other incorporates a bespoke dual NATO can carrier—one diesel and one water—and a mount for a gas (propane) bottle. The Kaymar rear bumper/rack is still the standard by which others are measured for strength and convenience, and the ball-bearing swing-outs have proven rattle-free after tens of thousands of kilometers of outback roads. No matter how clever the interior of the camper proves to be, we have no intention of holing up every night. On the inside of the rear door we find a drop-down table from Front Runner, this one distinguishing itself from similar items with the addition of a slide out side extension—brilliant. The Front Runner table, combined with our Kanz Kitchen chuck box (which incorporates a Partner Steel stove) means we can arrange an efficient outdoor kitchen in a few minutes. But what about shade for that kitchen in the desert? We have that . . . covered, with an Eezi-Awn Bat 270º awning, mounted on mighty aluminum brackets to the passenger (left) side of the vehicle. Fully deployed, it shades both side and back, providing plenty of shelter for cooking, eating, and relaxing. If desired, side wall panels can be added for privacy or blocking wind. Next up is the core of the Land Cruiser camper concept—interior plywood cabinetry made to our specs, with a recess designed to secure the Kanz Kitchen so it can be used in situ or removed to stand on its legs outside. We'll also be addressing the stock seats, completely collapsed after 23 years of what must have been ample Aussie backsides riding in them. The Expedition Centre is here. Front Runner is here. Kaymar is here. Eezi-Awn products (and many others) are available through Equipt, here. What is the best expedition vehicle in the world? Of course there isn’t one. “Best” as applied to an expedition vehicle means different things to different people, and can vary even then in different situations with different logistical requirements. And any vehicle one might name out of “the usual suspects” will have strengths that might suit one situation along with weaknesses that might not suit the same situation. The Jeep Wrangler Rubicon Unlimited, for example, combines unmatched technical-terrain performance with a poorly laid-out and small cargo area and low GVWR. The venerable (and no longer made) Land Rover Defender 110 combines an excellent layout and capacity for cargo, an economical turbodiesel engine, and all-coil-spring ride comfort with outdated and cramped driver and passenger accommodations and a history of bipolar build quality. The Mercedes G-Wagen (the diesel-powered world-market version) combines mightily overengineered running gear, excellent traction, and a high GVWR with a fearsomely high price and potentially overcomplex electronics. Then there’s the 70-series Land Cruiser Troop Carrier, or Troopy as it’s known. Arguably the most primitive of the bunch—the only one still riding on leaf rear springs—its reputation hinges more than anything else on unmatched reliability and durability. Tens of thousands of them have shrugged off tens of millions of miles of abuse from safari guides and non-government agencies, hammering on faithfully regardless. Years ago Roseann and I, through the auspices of a crooked fixer, led a safari in remotest Tanzania in a wreck of an early (all-leaf-spring) example. It had layers of flaked tan repaint on it; the ancient 103-horsepower 2H diesel engine wheezed and blew Vesuvius-sized clouds of smoke; there were no seals left on any opening and bulldust choked the interior to the point of actually reducing visibility for the driver; the alternator died during a night drive out of potential bandit country in Loliondo and we had to light our way with a flashlight. We loathed that vehicle by the end of the trip—yet it just kept running the entire time, and for all I know still is. Many thousands of miles in much nicer examples have reinforced our admiration for the Troopy—especially those powered by the later (post-1990) 1HZ naturally-aspirated six-cylinder diesel. This has proved such a dependable workhorse that it is still in production 25 years later despite the advent of the much more sophisticated and powerful twin-turbo V8 diesel. The 1HZ is reserved for markets such as Africa where power is less desirable than simplicity. 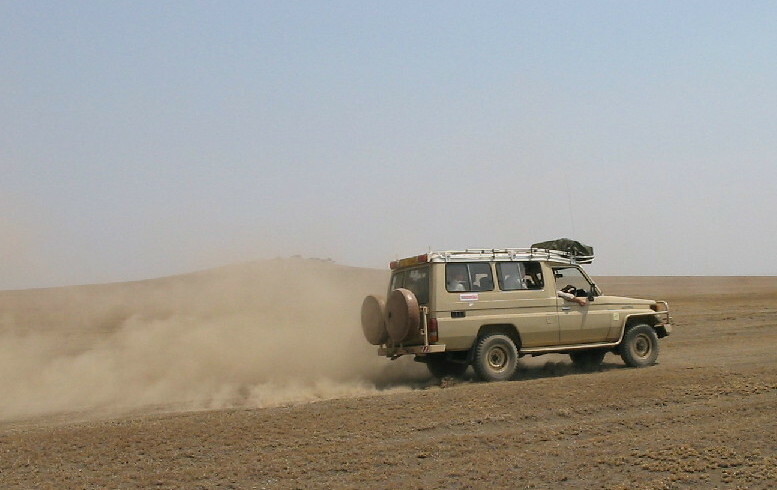 But reliability isn’t the only strength of the Troopy. Open the 60/40 split rear door and you are greeted with a cargo bay large enough to return echoes. It is literally cavernous, and the Troopy’s GVWR rating matches it. You could stash enough actual troops and armaments back here to engineer a coup d’état (and it’s probably been done . . .). 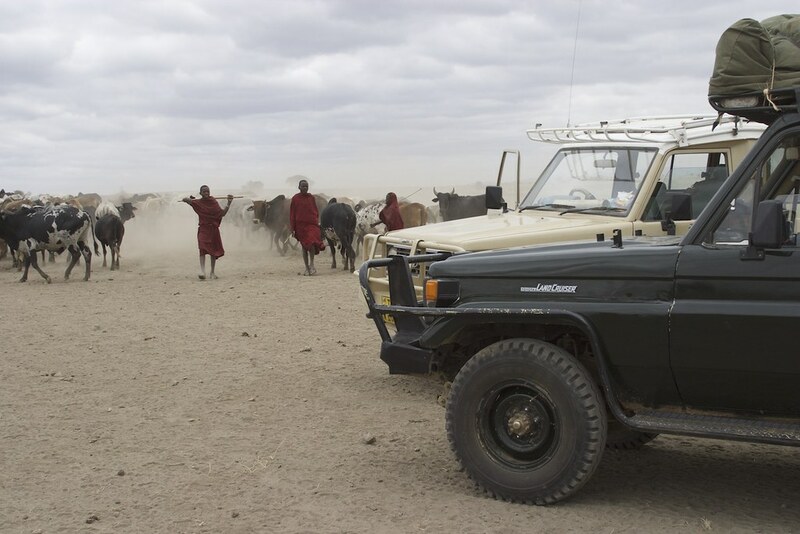 For mere safari duty there’s room for all the gear you could possibly need for an extended stay away from supplies. And speaking of capacity, many if not most Troopies are equipped from the factory with dual fuel tanks totalling an astounding 47 gallons. The driver and passenger seating area is spacious and visibility all around is commanding. Seating is comfortable if you get the individual buckets, not quite so good for the passenger with the split bucket/bench. Power-assisted steering and brakes make driving the beast easier than it would seem, and once loaded with guerrillas, AK47s, and RPG-7s the ride is really not bad at all. Finally, a comprehensive selection of bits to augment the strengths and correct the weaknesses of the Troopy is available from high-quality suppliers such as ARB and Old Man Emu. For those of us in the U.S. there was just one problem: The 70-series Troopy was never imported here, nor was any Toyota with the 1HZ engine. 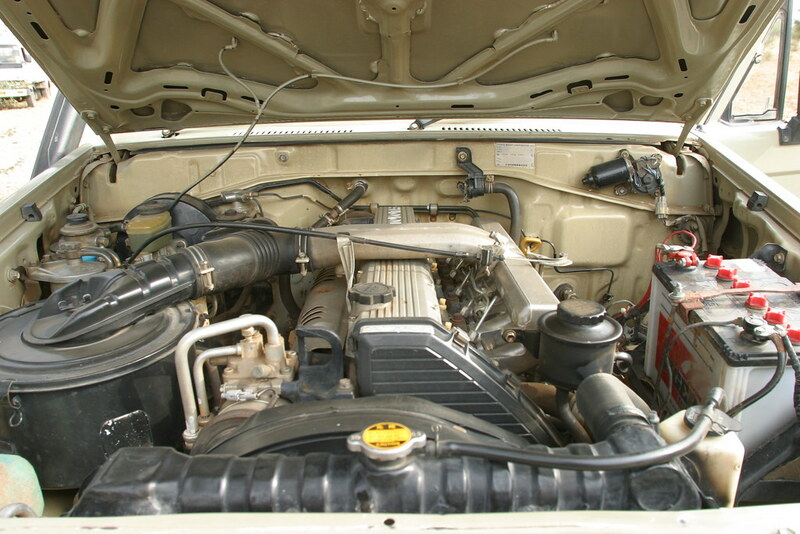 However, notice the date the engine was introduced—1990. That puts Troopies (and the companion pickup configuration) equipped with the 1HZ inside the envelope of the 25-year exemption for importing vehicles to this country. This was uppermost in our minds as we recently began planning a trip to Australia, where the 70-series Troopy is practially the official national vehicle for any travel off tarmac. Looking at ads on such sites as Gumtree brought up a good selection of vehicles, although many of them had obviously seen a lot of miles in the bush. Also, somewhat counterintuitively given Australia’s huge inland desert, rust is an issue—about 99.9 percent of the country’s population lives along the coast, and beach driving and saltwater fishing are popular pastimes. Prices for early 90’s Troopies ranged from around $5,000 (AUS) for dodgy runners up to $25,000 for pristine examples. Given the current favorable exchange rate (1$ AUS = $.75 US) this left a fair number of possibilities. 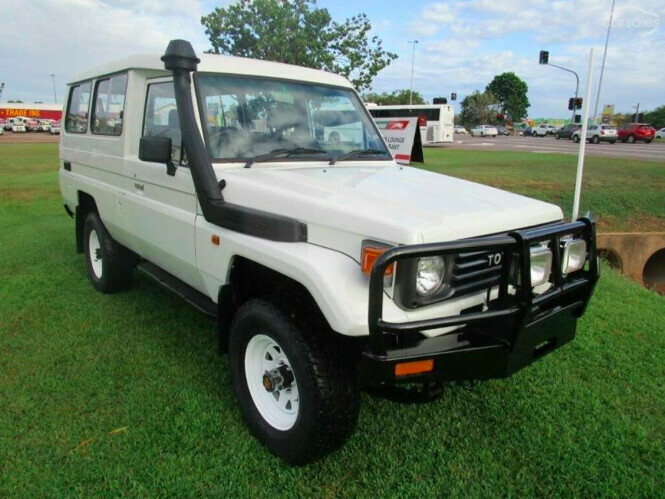 With some diligence and luck we found an extremely clean, low-mileage, one-owner 1993 model listed for sale at a dealer in Darwin, and after a few emails back and forth to confirm details, it was ours. Given its slightly later manufacture date, we’ll have to wait a couple years to import it, but we have plans for the interim . . . Meanwhile our friends Graham Jackson (director of training for the Overland Expo) and his wife, Connie, searched for and found their own Troopy, with higher miles than ours but equipped with dual locking differentials and a drawer system. Both vehicles are now on their way to the Expedition Centre in Sydney, where owner Daniel will be installing a few modifications before we arrive. Then we are off to the Simpson Desert for a solid shakedown run. If you’re interested in importing a vehicle directly to the U.S. and having most of the work done for you, look at AustoUSA.com. Phil Newell there is experienced in the entire export/import process. Of course Troopies are not the only potentials for one’s own version of the “best” expedition vehicle. There are plenty of Hiluxes, Prados, and Land Rovers available as well, including many that were purchased by visitors, fully kitted with roof tents, fridges, etc., taken on a trip, and then ut up for sale when the owners returned home. This opens the possibility of landing in Australia and picking up a fully prepared vehicle for your own journey for about what it would cost to rent one from the many outfitters there. The AustoUSA site lists all the costs to have a vehicle delivered to the U.S., including shipping, customs, etc. There is literally a “click to purchase” button.